Enter your town or address in the box below and click the Get Directions button for the best route to our lot. *Please call us for directions if you are having trouble using the map. You can also click here for turn by turn directions via Google Maps. To avoid any problems, please contact us to verify information about a vehicle you find on this site. 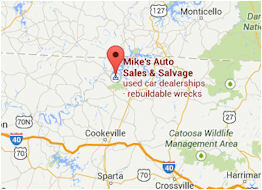 Mike's Auto Sales disclaims any liability due to typographical errors, misprints or mistakes.